I Think That There Are Actually People Out There Trying To Paint President Obama As Anti-Israel! Far be it from me to speculate what the motivations would be for people to want to mischaracterize the President’s positions and actions towards Israel, but it certainly appears that there are indeed folks out their who are claiming that, based upon the speeches which Mr. Obama made over the past week, he is the most “Anti-Israel President ” ever. (Shockingly, some of these comments have even been heard from those who are normally fair and balanced). What is even more upsetting is that if I am wrong (which I am known to be occasionally) and those people are correct in saying that he is insidiously anti-Israel, we have a bigger problem. Because that would mean, since their veiwpoints are so closely tied as you will see, that Prime Minister Netanyahu would be the most anti-Israel Prime Minister that Israel has ever had! And somebody had better wake up the Israelis ASAP so that they can drum this guy out of office because things are tough enough without having their country run by an imposter who is clearly as anti-Israel as this Obama no-goodnik. Why do I say this, you might ask? Because I have actually gone through the transcripts of the four speeches given since last Thursday and discovered something that really is surprising. When you strip away the audiences and all those standing ovations, when you look at the texts of these speeches, not only are each of their positions virtually identical, but they even use almost exactly the same themes. And, everyone talks about the importance of there being “no daylight” between the US and Israel, and I’ve got to tell you, when I compare the differences between Barrack and Bibi’s positions, I am surely not being blinded by the light. Although a lot was made of the “1967 borders” issue, anyone who listened to the speech or even read the transcript had to understand that “1967 borders with mutually agreed land swaps” was all part of a single phrase which should never have been parsed out separately. Also, as the President said in his speech to AIPAC, anyone who has spent any time at all following the current status of the peace process knows that virutally everyone agrees that any agreement will almost certainly involve just that: 1967 borders plus swaps. And when you actually read the details of what Bibi and Barrack both said about this, they really didn’t disagree. As to the Right of Return and Jerusalem, granted Obama did not agree with Bibi. On the other hand, he didn’t disagree either. What he was doing, it is clear, was trying to bring the parties together using the two issues that various reports (including Bernard Avishai’s NYT Magazine article about Olmert and Abbas negotiations) indicated they were close on: Borders and Security. The idea was that if they could show some progress on these issues, it could build trust and goodwill before moving on to the even more intransigent issues. So, my only conclusion, as difficult as it is for me to believe, is that there are actually people out there that want to misrepresent Obama’s stand towards Israel. And, heaven forbid, they may even be doing it for political purposes! Borders The borders of Israel and Palestine should be based on the 1967 lines with mutually agreed swaps, so that secure and recognized borders are established for both states. 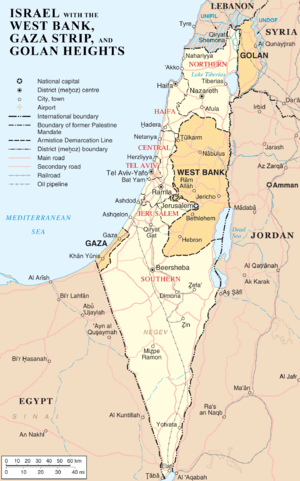 The borders of Israel and Palestine should be based on the 1967 lines with mutually agreed swaps, so that secure and recognized borders are established for both states. Borders III It allows the parties themselves to account for the changes that have taken place over the last forty-four years, including the new demographic realities on the ground and the needs of both sides. This compromise must reflect the dramatic demographic changes that have occurred since 1967. Enough with the Borders Already We will be very generous on the size of a future Palestinian state. But as President Obama said, the border will be different than the one that existed on June 4, 1967. Israel will not return to the indefensible lines of 1967. Self-Defense As for security, every state has the right to self-defense, and Israel must be able to defend itself — by itself — against any threat As for security, every state has the right to self-defense, and Israel must be able to defend itself – by itself – against any threat. When we say never again, we mean never again. Israel always reserves the right to defend itself. Security Provisions must also be robust enough to prevent a resurgence of terrorism; to stop the infiltration of weapons; and to provide effective border security. The full and phased withdrawal of Israeli military forces should be coordinated with the assumption of Palestinian security responsibility in a sovereign, non-militarized state. The duration of this transition period must be agreed, and the effectiveness of security arrangements must be demonstrated. [Emphasis added] Provisions must also be robust enough to prevent a resurgence of terrorism; to stop the infiltration of weapons; and to provide effective border security. The full and phased withdrawal of Israeli military forces should be coordinated with the assumption of Palestinian security responsibility in a sovereign, non-militarized state. The duration of this transition period must be agreed, and the effectiveness of security arrangements must be demonstrated. So it is therefore absolutely vital for Israel’s security that a Palestinian state be fully demilitarized. And it is vital that Israel maintain a long-term military presence along the Jordan River. Solid security arrangements on the ground are necessary not only to protect the peace, they are necessary to protect Israel in case the peace unravels. For in our unstable region, no one can guarantee that our peace partners today will be there tomorrow. Agreement Must Be Between the Two Parties These are the facts. I firmly believe, and repeated on Thursday, that peace cannot be imposed on the parties to the conflict. Delegitimization For the Palestinians, efforts to delegitimize Israel will end in failure. Symbolic actions to isolate Israel at the United Nations in September won’t create an independent state. You also see our commitment to Israel’s security in our steadfast opposition to any attempt to de-legitimize the State of Israel. As I said at the United Nation’s last year, “Israel’s existence must not be a subject for debate,” and “efforts to chip away at Israel’s legitimacy will only be met by the unshakeable opposition of the United States.”…No vote at the United Nations will ever create an independent Palestinian state. And the United States will stand up against efforts to single Israel out at the UN or in any international forum. Because Israel’s legitimacy is not a matter for debate. Iran See below A nuclear-armed Iran would ignite a nuclear arms race in the Middle East…This is why I ask you to continue to send an unequivocal message: That America will never permit Iran to develop nuclear weapons. Hillel ends his admonition with an imperative: The time is now. And so it is for Israelis and Americans who truly want to preserve Israel as a democratic homeland for the Jewish people. Although it has been said for years that the window of opportunity is closing, like the boy who cried wolf, this time it is really true. There are three major trends in the Middle East which underscore why it is so critical to move boldly and swiftly towards peace. The first is the Arab Spring. Everybody loves democratic uprisings – when they first begin. However, they do not always end up quite the way we hope. The very nature of grass-roots rebellions is that they tend to be short on organization, which opens them up to co-option as things move from the emotional frenzy of demonstrations in the streets to the reality of picking up the garbage in the streets. In Egypt, which is probably the best example of successful regime change, the final outcome is indeed still open to question. But the response of the Israelis seems to be that of delay. In March, we spoke with Congresswoman Jan Schakowsky who had just come back from Israel bearing the message from Israelis leaders that “Now is not the time for action. We need to let things settle down.” While there is some logic in that point of view, the counter argument carries a lot of weight as well. That is, it might make better sense to get an agreement moving farther along (including the support of other world nations) before things blow up around or in the Palestinian territories. In other words, it seems just as likely that spontaneous developments in the region will actually give the Israelis less control at the negotiating table than they have now. factor that overrides this: September. get the votes needed to pass the resolution as there are already over 100 countries that have recognized the Palestinian Authority. One Israeli official has been quoted as calling the possibility of UN ratification a “train wreck”, and rightfully so. If Palestine is recognized as a sovereign nation, it totally changes the legal relationship with Israel according to accepted international law. And while many American and Israeli spokesmen have minimized the validity of the vote and its potential impact, that seems to be the naïve point of view. So, the Arab Spring, the Fatah-Hamas détente, and most importantly, the anticipated Palestinian quest for statehood at the UN, all underscore the fact that time is closing in on Israel’s opportunities to control their own fate. But instead of urgency, what we hear loudest from the American Jewish community is denial. American Jews can stonewall and contend that the Israelis cannot possibly deal with terrorists (although let’s recall that the PLO was the foremost terrorist group in the world at one time) and that there is no one to make a deal with, and that the world is delegitimizing Israel, and that that old UN is once again being anti-Israel and anti-Semitic. We can do that. But that doesn’t stop the clock towards UN declaration of a Palestinian state from ticking. Why do we want to put the fate of Israel and Palestine in the hands of the UN? If we don’t act now to do everything we can to get the Israelis and the Palestinians to the table, we may well leave setting the terms of the agreement to others. Instead of continually reciting all of the obstacles to peace, we American Jews should do all we can to urge Israel to engage with the Palestinians. And soon. Instead of a wholesale rejection of Hamas, why not be creative? Find some clever way of giving Hamas an out that will allow them to save face with their own people, while providing some assurance to the Israelis that they are moderating. For example, while some in Hamas have maintained their hateful rhetoric, Hamas leader Khalid Mashaal has already indicated his openness to accepting an agreement under certain circumstances. Why shouldn’t Israel use these statements to open the door – even if it’s just a crack? it is no longer 1948. The relative powers in the region are very different than they were back then. As Hillary Clinton said last year at the AIPAC Policy Conference, the real dangers to Israel lie in demography, ideology, and technology – not from conventional military attack. And secondly, it fails to recognize the very real risks of doing nothing. More former Israeli political and military leaders than you can count have emphasized that the status quo is simply unsustainable. So, my hope is that my fellow AIPAC members and the rest of the mainstream American Jewish community will go beyond the same old platitudes that give all the reasons that peace is not possible and instead, urge the Israeli government and our elected leaders to make definitive, substantive steps towards peace. It is time to be bold and brave. We Jews are strong enough, we are tough enough, and we are smart enough to cut a deal with the Palestinians that, if well thought out, implemented and monitored, can bring better lives to everyone in the region. What’s Different About the New Israeli Peace Initiative? As many of you know, a group of former Israeli military and political leaders released an Israeli Peace Initiative (IPI) (full text here) on Tuesday to coincide with the visit to the United States of Shimon Peres, Israel’s President, and his meeting with President Obama. [Contrast that with what came from the Israeli government: a “coincidental” announcement by the Israeli Municipal Planning Commission that they had approved almost 1,000 new permits in the settlements]. The Initiative essentially combines elements of the Geneva Initiative of 2003 and the Arab League Initiative of 2002, but in substance doesn’t offer any dramatically different content. This statement not only reflects the truth, but also a fresh breath of humility. Both the Palestinian and the Israeli governments claim to want peace, but inevitably each of their statements contain some element of accusation about the other side – whether the attack is overt or covert, or just in a related context [viz., the housing announcement referenced above]. And you know what? Usually those accusations are correct. But is that any way to actually get to peace? At the same time that you claim to be reaching out to your adversary, you excoriate them for everything that they have done. While there are plenty of excoriations to go around, the point is that you have to move beyond the past, and even the present, to the future. The Palestinians and the Israelis will only make peace when they can both envision a different, more productive, more secure life for the region. That is precisely the vision conjured up by the those behind the IPI. One other thing that I like about this proposal is that it bases itself on the Arab Peace Initiative (API). While the API is not perfect, it does recognize the reality on the ground and makes several important philosophical concessions. But it is extremely significant that the drafters of the IPI chose to reference the API. It gives important recognition and respect to the other side’s views. Again, that is a crucial element that has been missing from the Israeli, Palestinian and mainstream American Jewish messaging. Without respect for the other, reconciliation is impossible.